This year’s North West Regional Swimming Championships were held over three weekends in May and June in Liverpool and Manchester and to qualify for this event is a huge achievement in itself. The standard is extremely high, but the nine swimmers from Carnforth Otters who qualified swam extremely well achieving a fantastic 19 final and reserve final places. Thomas Dugdale, 13, had a long wait until the final day of the championships to compete in the 50m butterfly. Tom had a strong swim, finishing in 12th position. 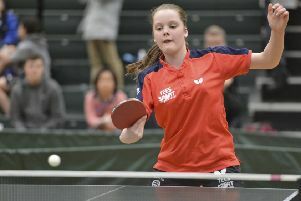 Aimee Banks, 14, has come of age this year and had an outstanding competition, reaching the final in five of her events. Finishing 4th in the final of the 50m backstroke was the highlight for her and a personal best of 32.72 qualified Aimee for her first ASA Championships in August. Ella Mounsey, 14, swam very well, finishing in the top 11 in all three of her events, achieving PBs and reserve finalist positions in the 100 and 200m backstroke events. Hannah Edwards, 14, qualified for several events this year and put in some solid performances. Her three breaststroke swims were all top 14 finishes, with a 50m breaststroke PB achieving a reserve finalist position. Alex Livingstone, 14, had a great competition, achieving PBs and top 15 places in three of her four events, including an excellent 800m freestyle swim during the first weekend. Emily Reay, 15, has battled with injury this season and despite a very unfortunate DQ at the start of the 50m freestyle, swam well in the 50m backstroke and 100m freestyle events. Holly Salisbury, 15, swam in four freestyle events, and achieved reserve finalist positions in the 50 and 100m freestyle, with a PB of 29.51 in the 50m event. Jess Shatford, 16, has also battled injury this year but managed two smooth, powerful swims in the 50m breaststroke heat and final to finish fourth with a PB of 35.09. This time qualified Jess for the British Championships in July. Competing in the open age group, Josh Thompson, 17, had a superb competition, reaching finals in eight out of his nine events. A very strong swim of 30.11 was enough to win the 50m breaststroke, but Josh’s highlights were his excellent performances in the freestyle events with PBs and second, fourth and fifth-placed finishes in 50m (24.07), 100m (52.54) and 200m (1.55.95). Aimee, Jess and Josh have all qualified for the National Championships in the summer. This year’s format sees a two tiered approach, with the top 25 ranked swimmers in each age category competing at the British Championships in July and the next 20 ranked swimmers competing at the ASA English Championships in August. First time National qualifier Aimee Banks will compete in the 14 years age group in the 50m backstroke event at the English Championships. This is a fantastic achievement for Aimee who has worked extremely hard this year. Jess was delighted to qualify for the 16 years age group 50m breaststroke at the British Championships after her great swim at the Regional Championships. Josh has upped his game this year to qualify for seven events – 50, 100, 200m breaststroke, 50, 100, 200m freestyle and 200IM – at the British Championships in the 17 and 18 years age group and two events – 50m backstroke and 50m butterfly – at the English championships.